Supply chain management is one of the essential activities that decide the company success (Cambra 2008).Nowadays; organisations are more focused towards supply chain to gain competitive advantage and to improve their efficiency. According to Mentzer (2001) Supply chain management is defined as the systematic and coordination of traditional business functions and tactics of a specific firm and along the business and also to improve the long-term performance of the supply chain. Wal-Mart is the world’s largest American retailer established 1962 in Arkansan-USA and operating in 27countries and runs over 10000 retail outlets and it holds the top position in financial year 2016 (Forbes 2016). Wal-Mart ranked number one in the global fortune 500 list in 2016 with $482,130 million revenues. They are many factors for Wal-Mart success but the most important factor is innovative business practices and its effective supply chain in the Food & retail sector (Traub 2012). 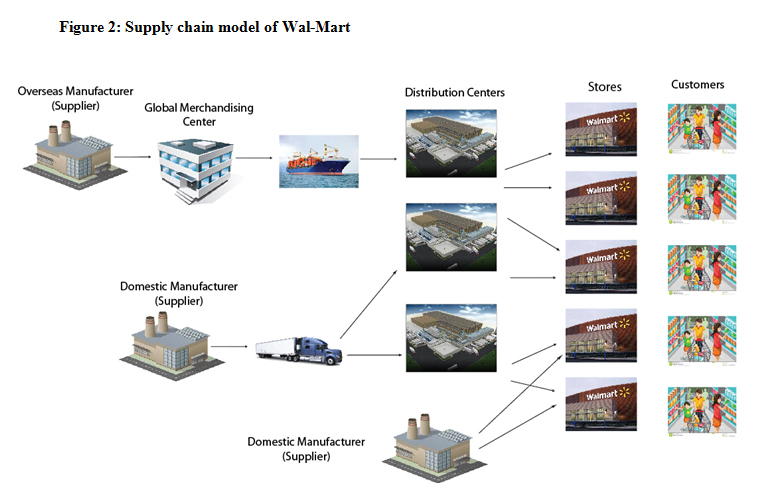 Moreover, Wal-Mart became a successful retailer with its speed, cost effective and high integrated supply chain. Wal-Mart retail and supply chain management strategies gained a competitive advantage to increase its growth over the other competitors. Information technology played a crucial role in Wal-Mart supply chain and information technologies initiatives helped in retail innovation in order to track inventory and restock shelves and associated them to cut costs. The coordinating technique helped for collaborative planning, forecasting, replenishment (CPFR) and vendor inventory management (Freeman 2011) Wal-Mart CPFR program assisted to reduce disruption in demand information and coordinated the business plan with supply chain partners. In Vendor inventory management aspect Wal-Mart and suppliers shared the data in order to reduce the inventory cost. Retail industry - The RFID technology provides a notable advantage over bar coding. Wal-Mart’s strategy and implementation of the technology was indicated as the most important technology development for retailers considering the bar codes (Gogoi 2005). RFID technology provides a very important advantage over barcoding and the tags gather information continuously as the products move from shelves to checkout counter. In addition, the RFID technology not only reduces the labour and maintenance for retailers and also gained lot of benefit form RFID technology with recording, keeping tack on purchases and stocking. Hence, from this technology Wal-Mart can save $6.7 billion in labour cost with implementation of RFID (Rockwell Automation 2004). Food and agriculture Industry – The governments increased the rules and regulations in USA about the food traceability and an official order from European Union tightened traceability requirements in 2005 and this forced RFID technology into food sourcing (Homs 2003).The technology can also support the traceability requirements at a decent price. Moreover, RFID technology is used to secure and identify the cattle by injecting a RFID tag into the animal stomach which allows exact records for automated farm management (Jain & Klastorin 2004). The first core segment is procurement and distribution channel where the strong pricing strategy required. Wal-Mart had made strong decision making to eliminate the third party or intermediate persons in procuring the goods. Wal-Mart has made the direct contracts with the Manufactures to procure goods directly. The direct procurement helps Wal-Mart to have best pricing strategy or policies like “Every day Low Cost” policy to customers (Chandran 2003) Wal-Mart have integrated their data base management with the information technology using the concepts like EDA, Point of sales sharing of the information to supplier has become more easy to access the real time data moving further Wal-Mart uses the RFID in there Distribution channels to make the process smooth. RFID consisted of barcodes which helps people to track the product and manage the demands in retail outlets, manufacturing units, warehouse etc. The RFID technique majorly used to organic food like milk and breads, meats in the consumptions will more compared other products. Tracking of organic food products real time data helps Wal-Mart to adjust their demand in the markets (Jones 2005). The upstream supply chain completely focuses on the process implemented by buyer of the firm and mainly focused on the supplier’s raw materials and materials which are not processed (Chaffey 2011). Procurement and inbound logistics are the main activity in the upstream supply chain. According to Muffatto (2004) procurement in its general, any activities related to operations between the firm and its suppliers which includes choosing their suppliers, ordering products, delivery, documentation and payment. The rapid increase in usage of technlogies that facilitate the procurement among the firms and the suppliers to support the operations and whole supply chainm (Chaffey 2011). Radio frequency identification is a generic technology used to identify objects by the use of radio frequency waves. RFID tags are the small ships embedded in the pallet or the product or item that to transmit and store the information about a particular unit (Homs 2003).The tags contains integrated circuit made of hard copper coil, conncted to the antenna and then packed into a closed device for further application. RFID is a vital for supply chain performance as it offers basic knowledge for supply chain managers to make better decisions (Gogoi 2005). The technology helps the organisations with increased in visibility of the supply chain and inventory management for better operational efficiency with decreased inventory and stock outs Supply chain management is combined with many applications and integrated together for improved planning and coordination of a firm’s supply chain to track and gather information of unfinished material and subcomponents, inventory and shipment. The application of RFID made the process easy where the employees no longer need to physically scan the bar codes entering the stores and distribution centres. In addition, by using RFID emplyees can easily obtain the information in real time and all the stocks which are stored in the distribution centres (Mark 2012). The Downstream supply chain completely incorporate the process of the seller side of the supply chain holding the distributors and customers (Chaffey 2011). Outbound logistics is the key activity of the supply chain to fulfill the end customer. Inventory management is the main downstream activity where all the distributors, wholesalers and retailers need to carry inventory to fullfill the customer (Benge 2018). Block chain is a digital ledger that maintains a continously growing list of data records or transactions. It’s a sequence of digital data which is connected like a chain and information regarded transaction will be recorded based on time (Guptha 2017). This transaction data will be updated to distribution ledge and cannot be edited or changed and it’s difficult to hack. All the transaction data can be viewed in the real time and changes can be made across the complete network or node. The major advantages of block chain people can be identify or see the history products and their components in which transaction data. Blockchain makes the procedure simple and estimating the execution and results of key supply chain management process (Guptha 2017).Once the following information is on the Block chain ledger, which are unchangeable and Blockchain allows the suppliers to track shipments, delivery progress. Block chain also provides trust with in the suppliers by eliminating the middle man, with better proficiency and cost can be diminished (Koetsier 2017). Ensuring product authenticity: Block chain can be used to confirm the product authenticity so that customer can go through the records about the products to avoid counterfeiting which increases confidence of the customers about the products and services quality (Arijit Chakrabarti 2017). Tracebility is important along the suppply chain to control the quality issues, compliance and bottleneck operations. Improved in tracking of food products among the supply chain leads to more cutomer trust and well organised planning (Chichoni 2018). Block chain technology helped Wal-Mart to track the pork products from Chinese farms to Chinese retail stores where the time was minimized from weeks to minutes compared to the past (Higgins 2017).Wal-Mart can go through the information about the farm, factory, lot number, storage temperature and the shipment address can be viewed on the blockchain and the insights about the food items help to pinpoint and recall during the food contaminations (Yiannas 2017). To sum up further, Wal-Mart has best technology to improve their efficiency in global markets. This report is mostly focus on technologies like RFID,EDA,CPFR, in different supply chain nodes. The major problem comes, when the technological factor should properly integrated throughout the supply chain partners and the implications will be highly impacted both hardware and software and situation become complex within the organisation. To avoid this kind of situations the Blockchain technology will provide information infrastructure layout between supply chain partners. Hence, Blockchain technology improves the transparency and traceability of the supply chain by eliminating fraud and errors, identifying the issues faster and increases the customer trust. 1.Abbaterusso, 2010. Supply chain management at Wal-mart, London: Ivey Business School. 4.Cambra, J. &. P. Y., 2008. Creating satisfaction in the demand-supply chain: the buyer's perspective. Supply chain management: An international Journal, 3(13), pp. 211-224. 5.Chaffey, D., 2011. 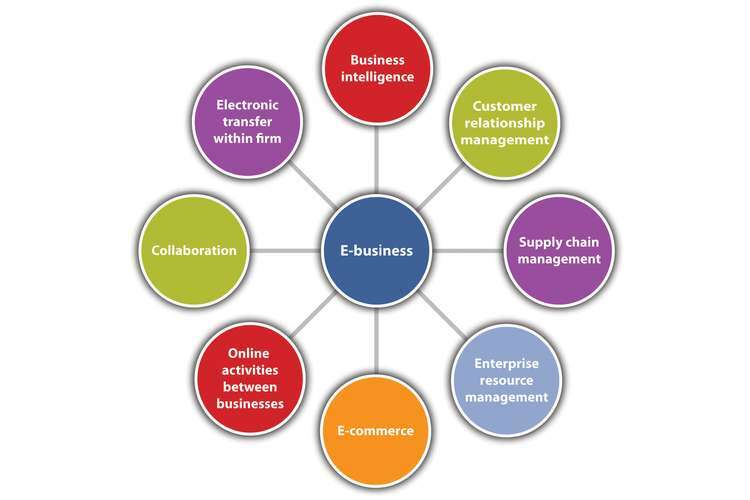 E-Business and E-commerce Management: Strategy, Implementation and Practice. 5th ed. Prentice Hall: s.n. 6.Chandran, 2003. Wal-mart's supply chain management practices. s.l., ICFAI Center for Management Research (ICMR). 8.Gogoi, P., 2005. "Retailing, the high-tech way",, s.l. : Business Week. 9.Guptha, M., 2017. Blockchain for Dummies IBM Limited Edition. 1 ed. Hoboken, NJ: John Wiley & Sons, Inc.
10.Homs, C., 2003. "Regulations means RFID tags for tracing food",, Cambridge,MA: Forester Research . 12.Jones, 2005. The adpotion of RFID technology in the retail supply chain. "The Coastal Business Journal", 4(1), pp. 29-42. 13.Kim S.M, M. J. T., 2006. Colloborative planning, forecasting and replenshiment , Illinois: (CPFR) as a relational contract. 15.Mark . K 2012. Half a century of supply chain management at Wal-mart, Boston: Harvard Business School Press. 16.Manju I, M J T, 2008. Global supply chain risk management. "Journal of business logistic", 29(1), pp. 13-150. 17.Mentzer J T, D. W. K. &. Z., 2001. Defining supply chain management. Journal of Business logistics, 2(22), pp. 1-25. 18.Muffatto, M. a. P. A., 2004. "Implementation of e-procurement and e-fulfillment process: A comparison of cases in the motorcycle industry". International Journal of Production Economis , 8(9), pp. 339-351. 19.Rockwell Automation , March,2004. "RFID in manufacturing", white paper, Milwaukee,WI: Rockwell Automation. 20.Jain & Klastorin, 2004. "RFID: management's latest headache or miracle cure? ", s.l. : E-Business Review.